Critical reading and writing makes us aware that knowledge is always culturally and disciplinarily constructed—always the product of particular people thinking in particular ways at particular times in particular places. A common response to this discovery on the part of readers is to lapse into a relativistic state of defeatism. They conclude that because nothing seems to have universal certainty (even what passes for the laws of physics change according to time and place), no ideas have any greater legitimacy than any others. This conclusion can induce a kind of intellectual lethargy, a disconnection from the world of ideas. Because one stream of writing on critical thinking, critical analysis, and critical reflection emanates from adherents of the Frankfurt School of Critical Social Theory—a body of work interpreting and revising Marx for the contemporary era (Brookfield, 2004)—there is a tendency to equate any activity with a name that includes critical with left-of-center political views. Students sometimes complain that for some teachers critical reading has a predetermined ideological outcome of turning the student into anything from a liberal to a neo-Marxist. In adult education programs where I have taught, this feeling sometimes expresses itself in the charge that my choice of texts shows I am anti-business. Given that critical theory’s main critique is of the logic of capitalism, this complaint from students is hardly surprising. However, it is important to remember that one of the most frequent responses to reading texts critically is for students to become much more skeptical of ascribed authority and much more likely to question ideas that were previously taken for granted. Since we live in a culture in which capitalist ideas are invested with such taken-for-granted authority that they constitute the dominant ideology, one possible consequence of critical thinking and reading is the student’s questioning of the moral basis and universality of this ideology. Critical theorists are quick to point out, however, that, critical reading in a totalitarian communist society would call into question the taken-for-granted authority of those dominant left-wing ideologies. The point about critical reading, properly encouraged, is that critical questions are asked of all ideologies, disciplines, and theories. So a critical social science turns a skeptical eye on all claims to universal validity. For a teacher to mandate in advance—either explicitly or implicitly—that only one ideological interpretation or outcome is permitted in a discussion or assignment is to contradict a fundamental tenet of critical thinking. That tenet holds that all involved—including teachers—must always be open to reexamining the assumptions informing their ideological commitments. For teachers this imperative is particularly important, since one of the best ways in which they can teach critical thinking is for them to model the process in their own actions. I hope, personally, that a critical reading of texts results in students becoming more skeptical of conservative ideologies, and more aware of the inhumanity of monopoly capitalism. And I feel a duty to make my bias known. But I also must continually lay out my own assumptions, and the evidence for these, and invite students to point out omissions in my position and to suggest alternative interpretations that can be made of the evidence I cite. For me to decree that “proper” or “real” critical thinking occurs only when students end up mimicking my political views would be the pedagogic equivalent of papal infallibility. I would kill at the outset any chance for genuine, searching inquiry. Most academics learn binge-writing from doing assignments in high school or undergraduate years. Bingeing becomes increasingly dysfunctional as tasks become larger. Writing an essay overnight is possible, but completing a 300–page thesis requires planning and sustained work. I also set up programs with faculty and graduate students in the Arts Faculty. One of the participants, Nichole, wrote that the program has “provided me with a non-threatening way of untangling my messy thought process, thread by thread.” Running these programs enabled me to learn much more about obstacles to writing and what helps to overcome them. In helping others use the Boice-Gray writing program, I make some specific recommendations. I suggest making notes about the points to be covered in your new writing, doing this a day or week beforehand. I recommend that when you sit down to write, you close or remove all books, articles and other polished text. Why? Because reading the polished text switches your mind into its flaw-noticing mode, the enemy of creating your own new words. I also recommend not reading yesterday’s writing, but instead using just your notes to provide guidance to today’s writing. Some academics say they are so busy they have no time to do 15 minutes of daily writing. What this usually means is that they have put writing too low on their priority list. These busy academics spend hours preparing lectures, marking essays, attending seminars and committee meetings — and checking emails, surfing the web, and gossiping with colleagues. Devoting 15 minutes to writing at the beginning of a nominal eight-hour working day can’t make much difference to getting other things done, can it? 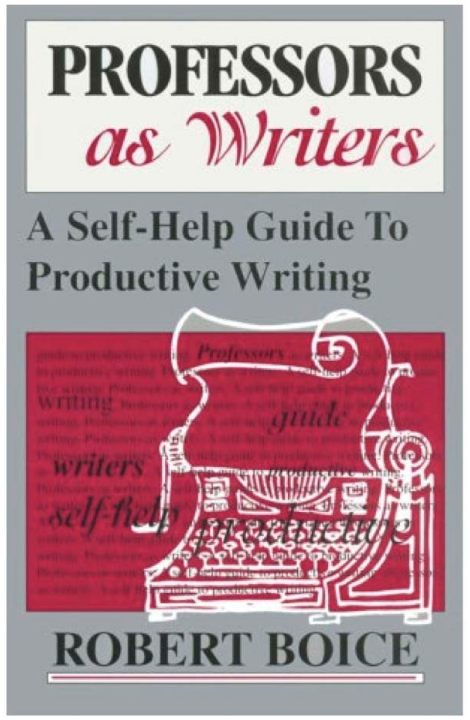 The title of chapter 4 in Boice’s 2000 book Advice for New Faculty Members is a single word: “Stop.” If the first principle of productive writing is to start, the second is to stop — before doing too much. For regular writing, you need to feel fresh when you start. If you feel worn out from too much writing yesterday or the day before, then you may postpone your session until tomorrow, starting a cycle of boom and bust, namely binge writing. So, Boice says, stop sooner rather than later. Gray in her 12-step program made the advice more specific: write for 15 to 30 minutes per day. This means stopping when you get to 30 minutes. That may not seem like much, but it’s only the writing part. There’s a lot of additional work required before this becomes publishable prose: studying key texts, obtaining data, running experiments, seeking comments on drafts, submitting articles, and perhaps revising and resubmitting. Writing is the core activity, something akin to the highest intensity part of an athletic training program, but it has to be supplemented by a lot of other work. I added one tweak to the Boice-Gray program. I ask participants to begin each 15–30 minute session by writing new words, for 5 to 20 minutes, and only doing other writing activities, such as taking notes or editing previous text, after the new words have been produced. I request this because composing new text is, for most writers, the most difficult task they face and the one most commonly postponed. This means starting writing even though you don’t know enough about the topic, you haven’t read all the background material and haven’t done the experiments or fieldwork or interviews. Indeed, you’re just starting work in a field that’s entirely new to you. How can you write about it? One approach is to write about what you’re going to do. Describe the things you know and the things you need to find out. Tell about the experiments you’re planning and how you’ll set them up. Tell how you’ll analyze the data. Another approach is pretty similar: start writing the paper that you’d normally write at the end of your research. When you come to any part that you don’t know or don’t understand, just do as well as you can and keep going. This feels very strange at first. Here’s how it works. By writing, you stimulate your thinking. In order to make progress on your project, you need to think about it — and writing is an efficient way of making this happen. Even after you’ve finished writing for the day, your unconscious mind will be working away at the topic, trying to address the matters you expressed. Of course it’s quite possible to think about your topic without writing about it. Writing is just a reliable way of sustaining and focusing the thinking process. How many people schedule 15 minutes per day of concentrated thinking about a topic? If you’ve tried it, you’ll know it’s not easy to sustain. Unconscious mental processing — during the time you’re not writing — is one thing that makes daily writing more efficient than bingeing. When you do a long stint of writing, you’re attempting to do all the thinking in one burst. This intensive effort can be exciting, but despite appearances it’s not as productive as harnessing the mind over longer periods. The brain is like a muscle: it responds best to sustained, incremental training. There’s another, more practical reason why writing first — before doing all the research — is more efficient than writing only at the end. Let’s say there are ten major books in the area you want to write about. The normal approach is to read them first, and probably you’ll want to read even more books and articles just to be sure you understand the topic. When you write first, before doing all the reading, you find out exactly what you need to know. You find gaps in your argument, points where you need examples, and places where you need a reference. So when you turn to the ten books, you don’t need to read them in full. You know exactly what you’re looking for, so you can just check the relevant bits. Does this mean you learn less? Not at all. When you read a book or article with a purpose, you’re much more likely to be able to remember crucial information because it fits within a framework you’ve developed. However, only a few writers find themselves in the fortunate position of being encouraged and supported to make these sorts of arrangements. The wider social circumstances are not particularly supportive — indeed, they are at the foundation of bingeing behavior. Boice says that established writers and editors are actually unsympathetic, as they think people who aren’t publishing don’t have anything to say. He quotes one editor as saying, concerning a writing program, “Why bother? 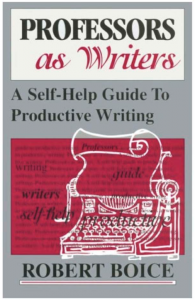 Too much is already being written and good writers don’t need help.” (Boice, 1990, p. 126). This sort of view, which Boice calls “elitist,” assumes that writers are born, not made. The Boice-Gray program challenges this sort of elitist attitude. It is based on the assumption that with the right conditions, just about anyone who wants to become a much better writer can do so. The program is also a challenge to every academic — you can do better too. Boice, R. (1984). Contingency management in writing and the appearance of creative ideas: implications for the treatment of writing blocks. Behaviour Research & Therapy, 21, 537–543.